The reissue of Rosemary Stevens's groundbreaking book on the growth of medical specialties offers a new opportunity to consider the state of the American health care system. 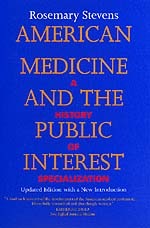 Updated with an extensive new introduction and a new bibliography, Stevens's book chronicles the development of the medical profession and shows how increasing emphasis on specialization has influenced medical education and public policy. She details specialization's effects on health care costs and on health care providers, and her concerns are especially timely: the implications of technology and the resulting ethical dilemmas, the issues of insurance, many people's limited access to care. As a long-time observer of American medicine, Stevens makes a valuable contribution to the current debate on how best to provide—and pay for—a high level of medical care in this country. Rosemary Stevens is Professor of History and Sociology of Science at the University of Pennsylvania. Among her books are In Sickness and in Wealth (1989) and, with Robert Stevens, Welfare Medicine in America (1974).